For those of you who have seen or used Qlarant’s predictive modeling web application PLATO™, you know that on the map view we show high risk Medicare Part D providers and pharmacies in clusters. This design allows our users to see, at a glance, which states or geographic areas on which they should focus their investigative effort. As opioid overdose has been declared a national crisis in the United States, more research has been conducted on the issue. One stream of research is on the public health implications with respect to treating the overdose patients. While treatment provided by professional facilities is the conventional approach, community-based treatment can sometimes be quicker and more efficient. According to the CDC, naloxone – a pure competitive antagonist at the opioid receptor, is capable of temporarily reversing the effects of an opioid overdose. Wider and more targeted distribution of naloxone to people at risk of opioid overdose, could lessen risky consequences those people might experience. Naloxone has been available in many pharmacies either over-the-counter or under a standing order, but if they can be accessible to friends and family of those who do overdose on opioids, the patients won’t have to wait for someone to go to a pharmacy, which might delay the treatment. Naloxone can be administered by the non-medically trained lay public, and it has been shown to reverse opioid overdose and save lives. Placing publicly available treatment kits is not a novel idea; automated external defibrillators (AEDs) have been placed in pre-determined, easy-to-access locations for use by bystanders in case they witness someone experiencing cardiac arrest. While locations for AEDs are relatively easy to determine, where to put the naloxone for bystanders still requires research. In order to identify locations to place publicly accessible naloxone, opioid overdose populations need to be shown to reside in clusters. This will ensure that naloxone distribution is not too scattered making it hard to justify the cost. 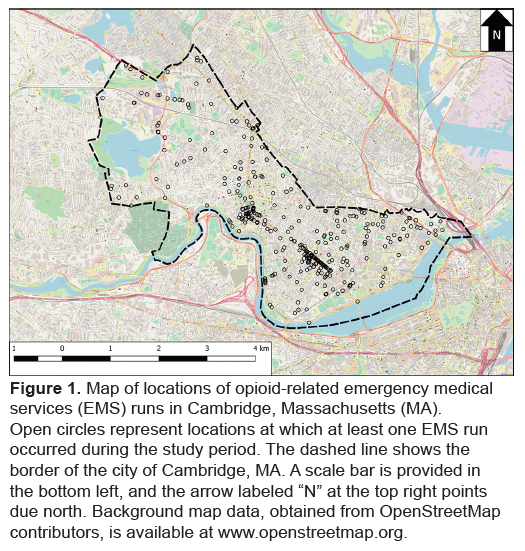 In a recent study published in the Western Journal of Emergency Medicine (2018: 641-648), Dworkis and his colleagues examine the opioid-related emergency medical services (EMS) data in order to find out whether opioid using populations exhibit significant geospatial clustering. If this hypothesis is proven to be true, they can identify potential locations to place publicly deployed naloxone (PDN) for bystanders to administer when a nearby person encounters opioid overdose. The researchers collected data from EMS runs that occurred in Cambridge, MA October of 2016 to May of 2017. An independent epidemiologist, who was blinded to their study hypothesis, determine whether an EMS run was related to a suspected or probable opioid overdose. 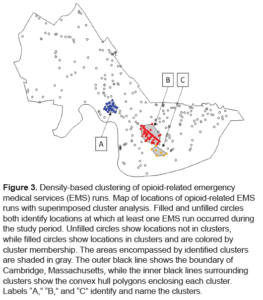 The data analysis resulted in 700 opioid-related EMS runs, spread among 359 unique addresses in Cambridge, MA. Geocoding the addresses led to a final dataset of 690 geocoded runs, shown in the Figure 1 here. Applying the geospatial clustering statistical method, 3 clusters (A, B, C) were identified shown in the figure 3 below. According to the author, cluster A includes 86 EMS runs (12.5%) from 42 separate locations covering a roughly circular area of approximately 116,948m2 (0.05miles2) centered on the Harvard Square area, a busy, mixed commercial-residential area containing a public transportation hub and parts of Harvard University. Cluster B was the largest cluster, involving 191 EMS runs (27.7%) from 81 separate locations spread over a linear / ellipsoid area covering approximately 319,630m2 (0.12miles2) along Massachusetts Avenue at the Central Square area, another large, mixed commercial-residential area containing a public transport hub. Finally, Cluster C included 85 EMS runs (12.3%) from only eight separate locations; however one of which is a community-based service organization that provides recovery services and emergency shelter to homeless individuals, including those struggling with drug and alcohol addiction. 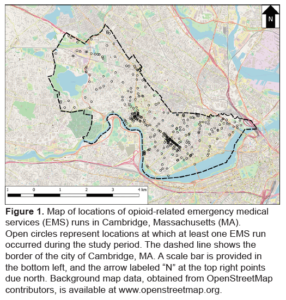 This location alone accounted for 76 (89.4%) of the MES runs in Cluster C.
Once the clusters have been identified, the researchers assumed the publicly deployed naloxone (PDN) sites to be accessible within 200 meters (m) in any direction of the cluster centroid. This number was chosen based a statistical method, but it also assumed that a bystander would be willing to travel 200 meters to access a PDN site. With these assumptions, the authors argued that PDN sites at cluster centroids could potentially have modified 75 EMS runs (87.2%) from Cluster A, and 116 EMS runs (60.7%) from Cluster B. For Cluster C, all 76 EMS runs from that single facility could have been modified by a PDN site at that location. Taken together, deploying PDN across all three clusters could potentially have modified 267 EMS runs, 38.7% of the total runs during the study period. This study was based on one city in one state, and the potential EMS run modifications were based on the assumed distance that bystanders are willing to travel. 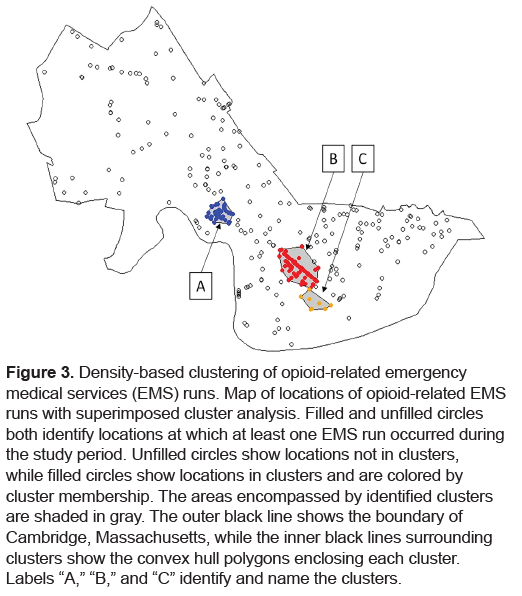 However, this study provides the first of its kind to identify clusters of opioid overdose population and aim to leverage community effort to combat the opioid crisis. Public health officials can adopt this approach for their own community, and it would be thrilling to actually see lifesaving success stories from bystander naloxone distribution. 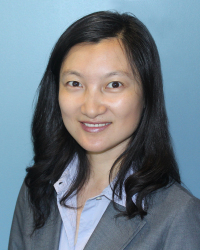 Yixin Qiu is a Project Manager with Qlarant and is involved in anything related to our Predictive Modeling Solution, PLATO™. 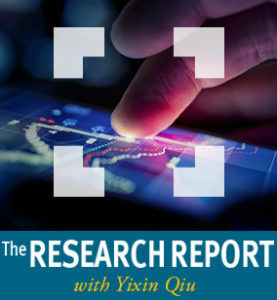 Yixin works with developers, modelers, SMEs, as well as outreach and support to deliver a high quality software platform with end users in mind. See all posts from Yixin Qiu.